Texas lawmakers created a new storage option for miners when they signed off on building America’s first state-backed gold depository in 2015. The Texas Bullion Depository, currently under construction and with the capacity to house physical gold valued in excess of $100 billion will be the most secure facility outside of Fort Knox, will have the full protection of the state of Texas, and is insured by Lloyds of London. Texas will have a lot of gold to protect — Governor Greg Abbott said when the project was announced last year that it would allow Texas to “repatriate” its gold from New York. The University of Texas/Texas A&M Investment Management Company holds $1 billion worth of gold bullion at the HSBC Bank in New York City, the Texas Tribune reported. “This goes back to the precious metals storage industry here in the US. Most of the depositories are in the east coast. I say why don’t we have more depositories in Texas? So, the legislature ultimately decided this was something that they wanted to do,” Texas Comptroller Glenn Hegar told MINING.com. “This is an opportunity for people to store precious metals in a variety of different options, another tool for those in the mining industry. This would also provide that additional oversight, that additional security, accountability, whether it is a short term or long term storage,” Hegar said. Hegar’s office selected Lone Star Tangible Assets, a firm that specializes in moving and storing precious metals, to construct and operate the depository with state oversight. Sean Forbes, chairman at Lone Star, is also managing director at the Texas Bullion Depository. Forbes said the new depository will provide benefits for the mining industry in terms of security, cost and mobility — the cost of transportation via Brinks armored trucks is included in the service. “We have a sliding scale charge rate that is more than competitive with any other bank depository out there,” Forbes said. According to Forbes, the depository is a solution for short- or long-term storage for mining companies that need a secure location to house treasury gold and other metals while holding for price changes or while waiting for the right buyer at the right price. The post Texas building gold depository with $100B capacity and security that rivals Fort Knox appeared first on MINING.com. Hole MCF-19-102 did not intersect massive sulphide, but returned a very respectable 20.0 metres grading 2.0% copper and 0.1% zinc within a zone of abundant copper laminations and stringers. The intersection formed part of a 36.6-metre section that graded 1.2% copper and 0.1% zinc. Noront said in a news release that a 25-metre wide zone of strong garnet-magnetite alteration with an associated zinc-lead-silver anomaly has been drilled immediately beneath the copper zone. The horizon appears similar in character to the No.10 zone, which suggests the two hydrothermal systems (No.8 and No.10) overlap in the area. A second phase of drilling at McFaulds is in the planning stages. The post Noront updates progress at McFaulds No.8 VMS discovery appeared first on MINING.com. In November 2015, Vancouver-based Lucara Diamond Corp. announced that it had recovered a 1,111-carat diamond – the second largest, gem quality stone ever found in the world – from its Karowe mine in Botswana. Following a country-wide contest, the stone was named Lesedi La Rona – meaning “our light”. Lucara put the Lesedi La Rona up for sale, but initially felt the price offered was too low. The miner hung onto it until September 2017 when it was sold to Graff Diamonds for $53 million or $47,777 per carat. Graff has now created a 302.37-ct square emerald cut diamond – the world’s largest of that particular cut. The company’s craftsmen used sophisticated software and lasers to make the initial cuts. The rest of Lesedi La Rona became 66 exquisite satellite stones ranging in size from under a carat to more than 26 carats. The post Graff creates 302-carat emerald cut stone from 1,109-carat Lesedi La Rona appeared first on MINING.com. BMO Capital Markets has initiated coverage of Probe Metals (TSXV: PRB) with an outperform rating and a C$2.00 target price—double its current share price of C$0.98. By Tuesday afternoon, the Canadian miner’s stock was up 7.37% on the TSX, trading at C$1.02. The company has a C$112.8 million market capitalization. The junior explorer’s 100%-owned Val d’Or East project “is one of the higher quality Canadian gold exploration properties with good prospectivity for resource growth and the potential to transition towards a development stage project,” BMO mining analyst Andre Mikitchook noted in an April 23 research report. Probe released assays at the end of March from its 24,000-metre winter drill program at Val d’Or East property, where its geologists have focused on an area around the former Beliveau, Bussiere, and Monique gold mines. The work program discovered a new parallel gold trend on the Courvan property, a largely unexplored area about 1.5 km west of the New Beliveau deposit. Results from the Courvan area drill program included drill hole CO-73 that intersected 3.9 grams gold per tonne over 30 metres starting 144 metres downhole in the Southwest Zone. Drill hole CO-78 in Courvan’s Creek Zone returned a 4 metre intercept grading 16.7 grams gold from 113 metres downhole, including 57.8 grams over metre. Probe expects to fold the results of its winter drill program into an updated resource scheduled for release in the early fall of 2019. According to its February 2018 estimate, Val d’Or East contains indicated resources for open-pit and underground of 9.04 million tonnes grading 2.35 grams gold per tonne for 682,400 ounces of gold and inferred of 9.30 million tonnes averaging 2.41 grams gold for 722,100 ounces of gold. Mikitchook also points to Probe’s other advantages: a proven management team and a strong treasury. The Courvan property is largely unexplored, the company says. The land package includes the historic Bussiere mine, which produced 42,000 ounces of gold at an average grade of 5.8 grams gold up until 1942, when it was destroyed by forest fires. 6th Wave Innovations has signed sales and marketing agreement for its IXOS nanotech gold extraction resin with CyPlus GmbH of Germany. CyPlus will represent 6th Wave in Mexico, Europe, Turkey and Egypt. IXOS resin provides a eco-friendly means of gold recovery. Each IXOS bead is imprinted at the molecular level to attract gold and ignore other elements leached from the ore. It also has the advantages of using fewer chemicals, reducing waste, and saving power than alternative technologies, according to 6th Wave. IXOS is supplied ready-to-use, with a range of particle sizes to accommodate heap leach solution and resin-in-leach/pulp circuits. 6th Wave has a pilot plant in operations at a major U.S. gold miner. It says IXOS has consistently outperformed activated carbon and conventional ion exchanges resins in both laboratory and field trials. The post 6th Wave, CyPlus sign representation deal for gold extraction nanotechnology appeared first on MINING.com. Keith Barron, who owns 53% of the outstanding common shares of Aurania Resources (TSXV: ARU), has agreed to loan the company up to C$3 million to support exploration at its 100%-owned Los Cities gold project in Ecuador. The chairman and CEO also participated in the company’s rights offering in March that raised C$5.25 million. Barron acquired 1.48 million of the 1.95 million shares issued at C$2.70 per common share. The geologist privately co-founded Ecuador gold explorer Aurelian Resources and discovered the Fruta del Norte deposit in 2006. The company was acquired by Kinross Gold (TSX: K; NYSE: KGC) in 2008 for $1.2 billion. Aurania Resources’ Lost Cities—Cutucu project is in the eastern foothills of the Andes mountain range in southeastern Ecuador. So far Aurania has eleven targets for gold-silver mineralization, four copper targets and one silver-zinc-lead target. On April 9, the company announced it had doubled the size of its Kirus copper-silver target to an area measuring 6 km by 3 km, samples from boulders in streams contain up to 12% copper with 166 grams per tonne silver. Follow-up exploration found mineralization of up to 5.1% copper and 70 grams silver per tonne in sporadic outcrops in dense jungle over a 2 km trend northwest of the Kirus magnetic feature. Kirus is about 6 km from Aurania’s Tsenken target, and both are associated with highly magnetic features evident in a geophysical survey the company flew over the Lost Cities project. Both targets have high-grade coper and silver in sedimentary rocks over, and adjacent to their respective magnetic features. On April 2, Aurania announced that its team had enlarged the Tsenken target by 6 km and that it has found high-grade copper and silver over a 9 km trend. Grab samples from boulders in streams contain up to 7% copper with 70 grams silver. The post Aurania Resources receives C$3m loan from chairman, CEO appeared first on MINING.com. Shares of Westhaven Ventures Inc. (TSX-V: WHN) took a hit on Monday morning, down over 12% at market open and at one point traded at a six-month low of C$0.60. The company’s market capitalization sits at just over C$57 million. Earlier, the company had released results from its ongoing drill campaign at the Shovelnose gold property, highlighted by 28.72 metres of 2.97 g/t gold and 13.68 g/t silver, including 1.55 metres of 32.60 g/t gold and 130.68 g/t silver. Drilling will continue at Shovelnose and expand from one drill to two drills this summer, says the company. The 15,542-hectare Shovelnose project is located in the prospective Spences Bridge Gold Belt (SBGB), which borders the Coquihalla Highway 30 kilometres south of Merritt, British Columbia. It is one of four gold properties owned by the company in the SBGB. The post Westhaven stock takes hit after Shovelnose drill results appeared first on MINING.com. Russia’s Alrosa, the world’s top diamond producer by output, is extending the life of its Aikhal mine to 2044 by digging deeper into the ground, in a project estimated to cost about RUB 10 billion ($16m). The 300 metres underground extension, the company said, will add almost 20 million carats to the raw material base of the Aikhal mining and processing division, allowing it to keep annual output at 500,000 tonnes of ore. Underground extension of Aikhal is estimated to cost about $16 million. “The project is also attractive because there’s no need for major re-equipment or new infrastructure,” Evgeny Denisov, Director of Aikhal Mining and Processing Division said in a statement. The Aikhal mine, located in the north-eastern part of Russia in the Sakha Republic, is one of the country’s and the world’s largest diamond mines. The operation is part of the namesake division, which also includes two open-pit mines — Yubileyny and Komsomolsky. Last year, the unit mined almost 12 million carats worth more $1.2 billion. The post One of world’s largest diamond mines gets 10-year life extension appeared first on MINING.com. Sandspring Resources (TSXV: SSP; US-OTC: SSPXF) is putting the finishing touches on a preliminary economic assessment (PEA) for its Toroparu gold project in Guyana that rescopes the project’s prefeasibility study (PFS), and includes a third gold pit. It aims to table the study in a couple of months. “All we’re really doing is building this same concept, the same conceptual operating plan that we had in 2013–2014 — we’re just building it in two separate phases,” Sandspring CEO Rich Munson says in an interview with The Northern Miner. Sandspring tabled its PFS in 2013, outlining a US$691-million, after-tax net present value (NPV) at a 5% discount rate, and a 23.1% after-tax internal rate of return (IRR) at US$1,400 per oz. gold, but with a US$464-million, pre-production initial capital expenditures (capex). The company went public in 2009 after working in Guyana since the late 1990s as ETK. In the 80s and 90s, it was the largest uranium producer in the United States. It built a 260 km road from a deepwater port to the project and drilled out a resource before realizing it needed to take the company public to keep advancing the project. After its PFS, the company signed a precious metals streaming agreement with Wheaton Precious Metals (TSX: WPM; NYSE: WPM). Wheaton bought 10% of the project’s life-of-mine gold production at US$400 per oz. gold and half of its silver production at US$3.90 per oz. silver for a US$15.5-million early deposit that Sandspring has already received, and US$138 million in project installments. 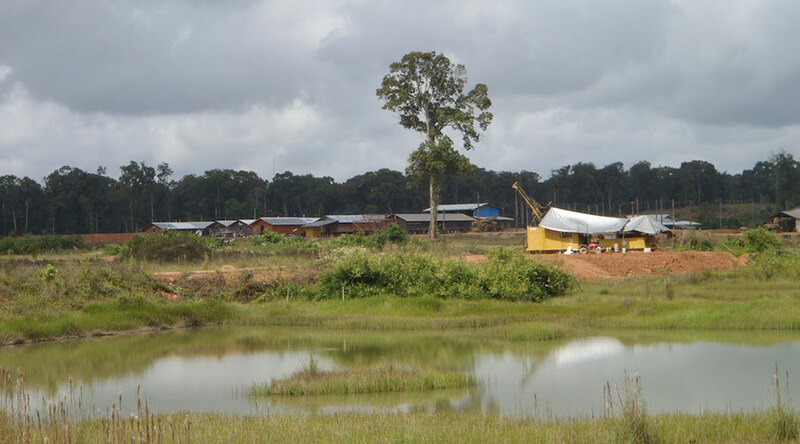 Sandspring Resources’ Toroparu gold project in Guyana. Photo by Sandspring Resources. Development at Toroparu stalled during the market downturn. In 2015 the company survived by Munson drawing down on his home equity line of credit to advance money to Sandspring. That same year, Frank Giustra came in and took a 9.3% position in the company. With his help, the company raised enough money to drill some satellite targets. Part of the problem was a copper component at the main Toroparu deposit. Vanadium redox flow batteries or VRFB are capable of providing free energy to power-deprived communities for more than to two years without hitches, a brief issued by VSUN Energy states. The Perth-based company, a wholly owned subsidiary of Australian Vanadium (ASX: AVL), followed up with one of its first customers, the Stuart family from a farming town in Western Australia, and learned that for the past 30 months their electricity didn’t fail once and, on top of that, they didn’t pay a dime for it. The Stuarts were pioneers in acquiring a vanadium redox flow cell in the country. They have been using it for a native tree nursery they own in the southwestern part of the state where they needed three-phase power instead of the provided single-phase power. 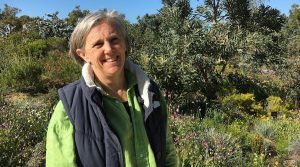 Farmer Lucy Stuart, a pioneer in acquiring a vanadium redox battery in Australia. Photo by VSUN Energy. According to VSUN, the CellCube system they installed stores energy from a 15kW solar photovoltaic system, enough to run for 10 hours at maximum output. “They also wanted the ability to boost the power supply, should they further expand the nursery. With VRFBs, increasing the power supply simply requires another vanadium electrolyte tank,” the renewable energy firm said in the press release. By relying on a vanadium electrolyte solution held in storage tanks, vanadium redox flow batteries can store energy from renewable sources, including solar, wind or wave power, and release it when required. VSUN’s documentation states that the batteries can be charged and discharged at the same time and can be cycled often and deeply. They are also supposed to have a lower risk of fire than lithium batteries. Vanadium occurs naturally in about 65 minerals and in fossil fuel deposits. It is produced from steel smelter slag, from flue dust of heavy oil, as a byproduct of uranium mining or directly from magnetite. The latter is the most common method. Around 98% of the vanadium ore that is mined is mined in South Africa, Russia, China, and Brazil, and most of it is used in steel manufacturing applications. Yet, the silvery metal’s importance to the energy sector is also growing rapidly, with more than 5% of global output used in energy storage. This growing interest from the battery sector has led to a rise in vanadium prices, which grew by 450% in the past three years and more than doubled in 2018. The post How energy-deprived areas benefit from vanadium redox batteries appeared first on MINING.com. Researchers from Kent Business School published a paper this week in the journal Environmental Science and Pollution Research where they state that increased demand for solar panels causes silver prices to spike. The researchers say that if silver prices go way too high, other materials such as copper and aluminium may start to be used in the development of solar panels. After analyzing a series of datasets from the London Bullion Market, installed solar energy capacity and solar gross electricity production between 1990 and 2016, the academics noticed that silver prices have risen at the same time there has been a spike in demand for solar panels. Examples of such situations are the years following the 2008 global recession when silver prices rose to $18.99/ounce, and shortly after 2011, when there was worldwide concern oil prices were becoming too high and silver prices climbed to $48.03/ounce. Given that it has the highest electrical and thermal conductivity of all metals, commercial solar panels incorporate about 20g of silver per unit. According to the experts at Kent, this means that the metal is responsible for around 6.1% of the total cost of building each panel. In the past year, the price of silver has fluctuated between highs of $17.29/ounce and lows of 14.07/ounce. The precious metal currently sits at $15.04/ounce. The post Experts say increased demand for solar panels causes spike in silver prices appeared first on MINING.com. Less than a week after agreements were signed and protesters lifted a blockade impeding trucks from bringing copper into the markets from MMG’s Las Bambas, there are threats of a new rally just outside the mine. On Saturday, the president of the Nueva Fuerabamba community, Gregorio Rojas, told local media that he is willing to organize a new blockade if the government doesn’t archive the criminal complaints filed against members of his community taking part in the protests against Las Bambas. Rojas said that some 500 people from his own town and from other places in the southern Cotabambas province are subjected to such complaints. He noted that even though the Chief of Cabinet Salvador del Solar said he would try to find a solution to this issue, the time has passed and nothing has been done yet. 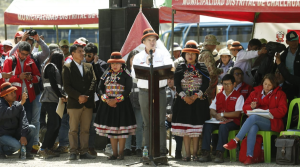 During a town hall held on April 11, 2019, the Chief of Cabinet Salvador del Solar, and the Minister of Development and Social Inclusion, Paola Bustamante, reiterated the commitments agreed upon by the parties in conflict on April 6, 2019. Photo by the Ministers Cabinet of Peru. In response to Rojas’ declarations, the Minister of Development and Social Inclusion, Paola Bustamante, told RPP Noticias that she was stunned because she has continued to foster the dialogue between the farming community, the miner and the state authorities. She also said that the government is fulfilling the terms of the accords that have been signed, among them the establishment of a human rights round table. Bustamante mentioned that her office even filed a request, on behalf of the Nueva Fuerabamba community, to have officials from the Judicial Branch and the National Prosecutors Office join the roundtable. The minister also said that she expects the dialogue to go on between all the parties involved in the conflict and she reminded Rojas that he and other community representatives signed a dossier agreeing to meet again on April 24th. “The conversation should continue without resorting to forceful measures,” she said. From early February to mid-April, a blockade had been taking place on Peru’s national highway CU-135, known as Corredor Minero del Sur, which is used by to carry copper concentrate from Las Bambas to the Port of Matarani. The protesters were members of the Nueva Fuerabamba community, whose farmland is cut by the road. They were accusing the government of illegally turning the road into a national highway to be able to ink a deal with MMG and its partners. Following a series of meetings that involved MMG executives, national and regional government officials, and community leaders, an agreement was signed on the first week of April. Activists committed to allowing free transit to be restored on the highway, a promise they fulfilled a week later; the government vowed to guarantee that local communities’ rights are respected and protected; and the company said it would employ workers from the community and honour unfulfilled promises established in a Compendium of Agreements signed on December 29, 2009.